The year 1968 marked a peak in the class struggle at the international level. Students and workers became protagonists of revolts in the West, but also in the East. The general strike and mass mobilizations of workers and students in France is one of the better known examples from that year. The uprising in Prague is the most famous example from Eastern Europe. 50 years later, a number of commemorations have been taking place around the world, reflecting on the legacy of those years. Few know that Yugoslavia also saw its own student revolt in 1968, strongly supported by the working class but also by important Yugoslav Marxist intellectuals. We recently interviewed Dragomir Olujić, best known as Oluja (Storm), who was an active participant in the movement. Oluja works as a freelance journalist and, as he introduces himself, is “retired but not in retirement.” He is also a member of a number of left wing groups. Oluja was born into a Catholic-Communist Herzegovinian-Dalmatian Partisan family; he has lived in number of towns and regions throughout the former Yugoslavia, but for the last 51 years, he has lived and worked in Belgrade. He claims to be “a Marxist and a communist, not a Yugo-nostalgic but a Yugo-futurist.” He arrived in Belgrade in 1967 to pursue his studies at the Faculty of Political Science. During his studies, he worked manual jobs, wrote for student and youth journals, played basketball and table tennis, and was active in politics. At the time, he was a member of the League of Communists of Yugoslavia (SKJ) and the Student Alliance of Yugoslavia (SSJ). We publish here the first part of an interview conducted by Philippe Alcoy and translated from Serbian by Milica Popović (Part 2 will appear on Friday, June 29th). How did the protests take off on the 2ndof June in 1968? In Belgrade in those days, near the Studenski Grad (Student City), there were active youth work brigades working through the ORA Novi Beograd (Youth Labour Action of New Belgrade). These youth brigades were preparing the field for the construction of a highway, a transfer point for the Zemun railway, a new railway, as well as an overpass and tunnel on Bežanijska Kosa. The Friendship Caravan, a popular traveling music show organized by the newspaper Večernje Novosti, was about to start. The leadership of the Caravanhad planned to start its journey across Yugoslavia with an event in the open air, bringing together the youth work brigades and students of the city on June 2nd. The weather forecast had announced that it would rain, so the organizers, including Anton Marti from TV Zagreb (at the time the most acclaimed director of TV mass events in Yugoslavia), got concerned about the safety of their recently acquired, among the first in the world, electronic equipment and decided to shift the entire program to the movie hall at the nearby Workers’ University. Only the brigade members, and not the students, were informed of the venue change. When students nevertheless tried to enter the hall, there was an incident that the local security did not manage to contain and a large fight broke out, with the local police intervening to no avail. The news spread quickly throughout the Studenjak neighborhood: “They are beating the students again,” causing the whole Studentski Grad to rise up. Some of the students went to sleep, but the discussions on what to do next and how to do it, started immediately. A lot of our comrades and friends from different parts of Belgrade came down to join us, from other student dorms, even some neighbors. While we were discussing our next steps, the newspapers published the ‘information’ that a large group of hooligans had rioted in New Belgrade, with TV Belgrade repeating this as breaking news at 4am. We agreed to organize a protest and after the protest to head to the Federal Parliament with our demands for the immediate resolution of key social, political, and of course, student and university problems. We also demanded that the police be sanctioned for using excessive violence against the students. Of course, when the next day came around, we started moving towards the center of Belgrade at around 11am. At a key underpass, we were greeted by a large police presence. A locomotive with 10 wagons was parked on the railway, so that we could not run over the embankments (there was a story that there was a large unit of the army on the other side, perhaps even with tanks). There were ten politicians there as well. First the negotiations started – on the student side were Vladimir Mijanović (or Vlada Revolucija), professor Dragoljub Mićunović, and a group of students, and on the other side were Veljko Vlahović, a Spanish civil war volunteer and the party member responsible for culture; Miloš Minić, president of the Parliament of Serbia; Branko Pešić, the mayor of Belgrade; Simeon Zatezalo, city party functionary; Slavko Zečević, first man of the police in Serbia and others. The politicians suggested that we form a student delegation that would be admitted to the relevant institutions; Vlada and Mićun insisted on our demands and our collective intention to march in front of the Yugoslav Parliament. I was in the student mass, we were waiting for the negotiations to end and to continue our protest. In the meantime, from the city and other student dorms, our friends, comrades and colleagues were ‘filling up’ the faculties, and waiting for the outcome of the fight at the underpass. Many from Studenjak used different routes to get to the city center – some of them even swam over Sava or Danube, to get to their faculties. And, that is how the ‘student revolution’ started! The revolt of the Belgrade students took place in an international context that was very ‘agitated’: the war and the struggle against the war in Vietnam; the struggles and the anti-colonial revolutions in the countries of the ‘Third World’; the assassination of Che Guevara in Bolivia by the agents of the CIA that shocked the youth of the world; the movement of May 1968 in France; the events in Czechoslovakia; the Cultural Revolution in China. In which way did all these events find an echo among the students and the youth in general in Belgrade and in Yugoslavia? Did those events have an impact on the workers in Yugoslavia? Anti-war demonstrators in the US in solidarity with national liberations struggles in the Third World. All these events were an outcome of tectonic social processes, or, to say, class struggles, no matter how enclosed within national borders they were! In my opinion, the potentials of the existing regimes and systems were drained out in the 1960s – in the East within the so-called real-socialism, including the Yugoslav one, through “the thirst for consumption”; and in the West within the capitalist countries, through declining profit margins. Those were the times of searching for new solutions to the many problems that had appeared, including developmental ones. It was also the time of the final anti-colonial struggles – those new regimes were also facing developmental problems. The economy in the West came to resemble Papin’s cooking pot; there was hyper-production, that amount of goods was not possible to sell. The Eastern market, especially the Soviet Union, was closed until then – due to both Soviet and Western politics. Willie Brandt in 1966 came up with a ‘solution’ – announcing his so-called ‘Eastern politics,’ and in 1971 signed a deal with the USSR. This was followed by agreements with all Western countries. One way or another, borders and markets were being opened up. The West introduced so-called socialist measures, above all, state interventionism in the economy and the strengthening of the welfare state. At the same time, the East was introducing capitalist measures, above all, the reintroduction of private property and markets, mass layoffs, and bankruptcies – with Yugoslavia and Czechoslovakia at the forefront of such reforms. The problems moved from one side to the other, the ‘atmospheres’ and energies balanced out, and we came to a situation in which the problems of people in the East became problems of the people in the West and vice versa. This allowed, for example, for the American problem of the war in Vietnam to become a global problem, a problem for all people in the world. The field of social struggles widened so it was not accidental that student struggles and workers’ strikes converged in all countries. The Cold War, with its policies of ‘peaceful coexistence’ of two, or three, blocs became a Cold War with policies of ‘peaceful cooperation.’ All together, the world was slowly but steadily becoming singular, especially in the sense of production, in spite of all the national-protectionist limitations! Those are the roots of the problems that the first baby-boom generation, born after the Second World War, was facing. It was the youth of that generation entering public life in the sixties and facing the heritage of their parents – their parents’ politics of ‘peace, order and discipline.’ So my problems as a young man of 18, 19, 20 years were the same as problems of those of Daniel Cohn-Bendit, Rudi Dutschke, Tariq Ali, Abbie Hoffman… in Germany, France, UK, USA etc. So, we had the same problems, we had the same way of thinking, the same wish to disagree with the imposed lifestyle of ‘keeping quiet, studying, and working,’ including the same need to change lifestyles and create a new life for ourselves. And, of course, we were completely aware that without workers we would not be able to accomplish much, we were aware that we belonged to that side of the class front! Of course, it went in waves: the USA, Germany, UK, France, Italy, Japan etc. And of course, it had an echo here in Yugoslavia. We followed the events, through – even if controlled, but still high quality – state and party newspapers and literature; through the journals we had (and, so to say, controlled), including Praxis, Perspectives and Cause in Zagreb, Philosophy in Belgrade, Paradox in Ljubljana etc. ; through our youth and student newspapers. And we reacted through texts, through actions, by taking positions, ranging from anarchist, to Trotskyist, to Maoist ones. And then of course, we had contacts and meetings with our colleagues from all over the world, meetings that became increasingly activist nature. We reacted to world events. As examples, I would single out two cases I participated in. In March 1968, we prepared a petition against the expulsion of a group of professors, including Leszek Kolakowski and his comrades from the University of Warsaw, demanding that the University of Belgrade invite them to work here. In April 1968, as a reaction to the attempted assassination of Rudi Dutschke, we held a series of protests at the universities and a vigil in front of the German embassy. We had experience confronting the police – for example, in 1961 when students organized protests in reaction to the assassination of Patrice Lumumba, marching on the Belgian and American embassies; or in 1966 when we marched on the American library and embassy, following a protest in support of the Vietnamese people’s struggle at the Faculty of Philology. What were the political, economic, social, and cultural elements in Yugoslavia that influenced the revolt of June 1968? For instance, in 1965 there were the so-called ‘pro-market’ reforms; did they prepare the ground for general dissatisfaction? I already explained how in the mid-sixties the two world blocs – capitalist and socialist (including Yugoslavia) – had exhausted their developmental potentials and had fallen into crises: it was the first postwar recession of capitalism, before the first energy crisis, and the second crisis of (Soviet) real-socialism. They were both searching for solutions – capitalism ‘improving’ itself through socialist (namely, state) interventions and socialism ‘enriching’ itself with private-capitalist elements! But I want to go more deeply into the ‘Yugoslav response’ to these questions. Due to all this, the party and state leadership in 1961 came up with a ‘small’ reform – decentralizing and liberalizing the economic system, introducing the convertibility of the Yugoslav dinar, as well as launching the development of “classic” financial institutions, along with import liberalization. In 1965, under the slogan of seeking an “insertion into the international labor division” and into the world market, a ‘big’ social and economic reform was lunched – entailing further liberalization and decentralization of the economic system in the direction of a market economy and the development of market institutions, as well as adjusting self-management to the parliamentary system; entering IMF arrangements; investment financing was transferred to the jurisdiction of commercial banks; private property was allowed in the form of ‘civil’ enterprises; workers’ rights were diminished as layoffs were deregulated by means of procedural simplification; the possibility of bankruptcy was established; imports were liberalized to a maximum; foreign currency income was centralized; salaries were frozen… The party ideologists did their job – they came up with a number of mystifying slogans – including the advent of “socialist commodity production”; “income” instead of “profit”; and “market-valorized distribution according to labor”. The result was a drastic drop in production; a fall in citizens’ real incomes; the radical deepening of social divisions; rising corruption. In a short period of time approximately 700,000 workers were laid off, of which 400,000 became migrant workers, or “gastarbeiters” (guest workers), through bilateral arrangements with Austria, Germany, and other Western countries. Only bankruptcies were not implemented due to strong worker resistance. All of these developments sparked huge dissatisfaction – the number of workers’ strikes and the number of participants in those strikes doubled; strikes started to last longer; different ways of obstructing the reform measures were implemented (‘white strikes,’ increased ‘sick leaves,’ etc. )… The dissatisfaction was shown also in movies, in theatres, in literature… and of course, mostly among the youth, and especially among students! Many of the young people who took part in the movement of 1968 never experienced capitalist society; they were born in a socialist Yugoslavia. How was it to be young at that time in Yugoslavia? And how was this specificity expressed in the demands of the student movement in 1968? 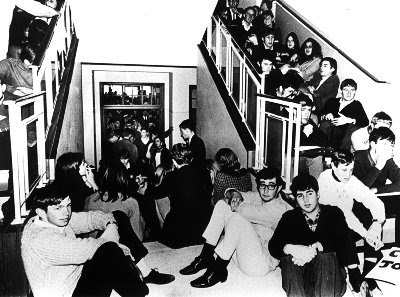 Students congregating for a meeting in Belgrade (June 1968). We did not experience capitalism, but we did know a lot about it! There was a rich (not only Marxist) literature, translated or authored locally. We had high quality journalists, based around the world; we read extensively in the newspapers and listened to their radio reports; we listened to foreign radio stations. There was a rich and ‘worldly’ offer of films, theatre plays, exhibitions, literary encounters and meetings with other artists… Not to mention rock’n’roll, sport events, meeting sport fans from abroad and talking to them… and finally, about capitalism we learned a lot through the life stories of our migrant workers! 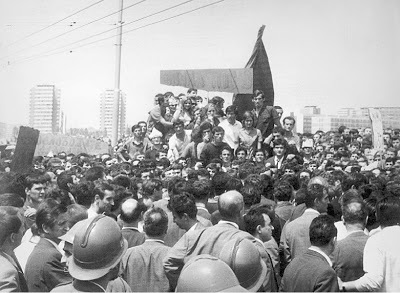 Student protests in Albania: “What we ..
During my studies, I lived and worked in the Student City (Studenjak) – a large student dormitory complex in Novi Beograd, so I can tell you about the life and the hopes of the youth from the perspective of the Studenjak – especially since 1968 started right there. The specificity of Studenjak was that it was full of youth from the whole of Yugoslavia, and our parents weren’t there. If you Google Studenjak today, you would probably get a completely different picture. The management and administration of the Studenjak were in a special building – between the second and the third bloc – together with a couple of small shops and an enormous restaurant/student cantina (those who were quick could get a second serving). On the ground floor of the second bloc, in the F-wing, was a radio station Studentski grad. The Radio was ‘harassing’ students three times a day with its service – information, talk, and a music program – in the morning (there was no breakfast served at the time), for lunch, and for dinner. In the third bloc, there was also the ‘Society of Arts and Culture’ (KUD) “Žikica Jovanović Španac” and an alternative/experimental drama studio – its stage was two bus stations further away towards the city center, above a cinema called Fontana. In the first bloc, there was a small ambulance with a dentist and a student cooperative with excellent job offers. There was also a huge field – where we played football, university league even, basketball, badminton, organized parties and open-air concerts… Behind the fourth bloc, there was an open swimming pool belonging to a construction enterprise where we bathed in the summer and hung-out with their workers, and further towards the factory IMT, where they are now building blocs, the highway, the railway, there was a forest – we called it the Fifth Bloc and then further on were village houses with fields and gardens. The most romantic ones in the evenings visited the Fifth Bloc, and the more practical ones the gardens – to enrich their nutrition with fruits and vegetables, and not only with love. Below these houses and gardens, there was a famous – not there anymore! – coffee house (kafana) Jakarta, always full, vibrating with adrenaline… It provided excellent food and drinks, great company; some were even playing cards… And if there were not at least two fights in one evening, it could not even be considered to have been good fun!? For the quieter ones, there was Radnički, the old part of the restaurant across the first bloc. There was also a workers’ university Novi Beograd, which has now been privatized. Besides regular programs for citizens, mostly of an educational character, and a cinema hall – there was also an open-air cinema, a fenced space where from spring till early fall we would watch ‘suitable’ films. Further towards the city center, there were workers’ barracks, so every day we would loudly discuss with the workers! Life in Studenjak was exciting, tumultuous, and tiring – every day there were at least ten parties (whether you attended them or not), one needs to be able to handle that! Everyday debates and discussions in the open gave a sensation of an Athenian square… and then there were the concerts. On Saturdays and Sundays in the round hall of the restaurant there was live rock’n’roll. It didn’t take much, especially if it was raining, for the students to go to the balconies and yell ‘Boohoo, God!.’ From that environment to the ‘philosophy of ’68’ there was only one step.